The machine has been designed to fill a gap between a standard panel saw and a beamsaw and is an innovative product produced by Fimal. 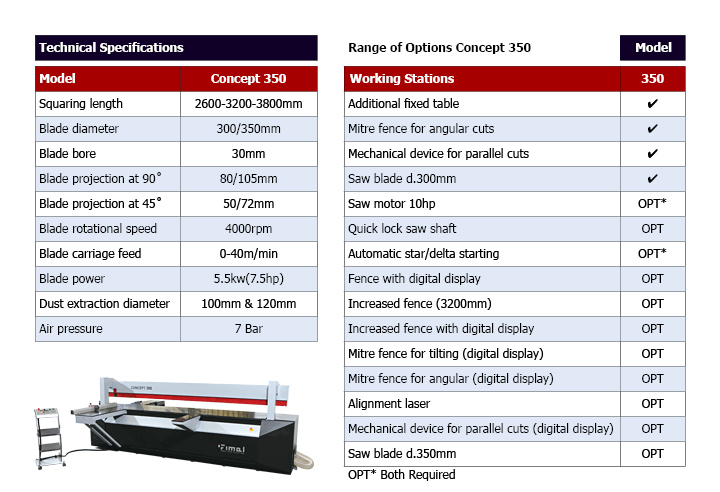 Compared to standard sliding table saws or vertical saws the Concept 350 is more accurate, easier to use and can be up to 3x more productive. Allows the small to mid-sized company to advance with capacities and accuracies previously only available to larger operations with much larger machinery budgets. Occupies about the same footprint as a sliding table saw but doesn't require valuable floor space in front or behind like a sliding table saw does. Sizes panels accurately and chip free with a very unique single blade scoring function. Bevel cutting of 0-46 degrees is possible with the standard electronically controlled blade tilt. The 300-350mm blade is completely enclosed during the entire cutting cycle thus ensuring operator safety.